At this point, the only theme I can honestly say I'm consistently sticking with for 1GAM is "something different." I've done one modern take on old-school overhead adventure, a side-scolling platformer, a narrative-driven experiment, and a board game. Naturally, the next step is... card game. The concept of Fated Duel is a combination of several ideas that came to me over the past few months, combined with a conveniently-compatible May theme for 1GAM. For one thing, I'd toyed with the idea of making a card combat game a few times this year, and had gotten as far as some brainstorming sessions, but I had yet to come up with an interesting mechanic or hook. I'd also recently been playing a couple of deck building games with my local gaming group, and while I found them basically enjoyable, I had the same complaint a lot of people do - too often, they feel like competitive solitaire, with very little meaningful interaction between players. I liked the idea of deck building as a mechanic to work with, but if so, it had to be something more directly competitive. Last month, I first came across the Ludology podcast, and listened to the first few episodes. One that that particularly caught my interest and got me thinking was their episode about Catch-the-Leader mechanics. In short, it's exactly what it sounds like - a mechanic built into a game to allow trailing players to more easily catch up with a player who's winning. Without a mechanic like that, it's too easy for your game to end up with a runaway leader and bored players just going through the motions to finish up a game because they can't possibly win. On the other hand, with a catch-the-leader mechanic that's too powerful, a game feels rigged to punish anyone who takes the lead. If I had to sum up Fated Duel in one line, that would be it. The central theme and one of the key mechanics of the game both boil down to one idea - every injury you suffer carries with it the knowledge to grow wiser and stronger. In Fated Duel, this is implemented in a card battle theme as Wound/Wisdom cards. In combat with your opponent, successful attacks inflict wounds, which are represented by special Wound cards. When combat ends, each Wound card is flipped over to become a Wisdom card, which is the currency each player uses in a simple deck-building "training" phase. After training is complete, you go back into battle for a rematch, with your existing knowledge of your opponent and improved deck. Thematically, I liked the idea of the duality of Wounds/Wisdom to represent failures and knowledge, and mechanically this also served as a good starting point for a catch-the-leader mechanic, since the winner of each round would often have suffered fewer wounds, which leaves them with less wisdom, which means they're not able to make as many changes to their deck between battles as the loser of each round. In a happy coincidence, just as I was beginning to work out the basic mechanics of this game, the May 1GAM theme was announced: "Grow." The Wound/Wisdom mechanic fit perfectly; the theme and the mechanics of the game are based primarily around your character's growth over time, so I decided to keep pushing forward along those lines. The other theme I wanted to explore was the idea of making a game where, even within the game world, the competition itself was the goal. It's tempting to add an artificial feeling of epic scale to a game by using larger and more exaggeraged themes and settings - conquer the world, kill the bad guys, save the kingdom, destroy the evil empire, etc. I liked the idea of combatants engaging in combat simply because at their level, there are only a few people in the world who can truly challenge them, and they come together just to test each other and learn from the experience. Just a quick, simple animation showing that these two (who in the SF storyline were raised as brothers and trained together) are not fighting out of anger, hate, greed, or even a desire to truly do each other harm. They respect each other, and they fight as part of a journey they've both been on, separately and together. Fated Duel is a game about people like this - combatants who fight strictly for the challenge, to learn about their opponents and themselves, and push themselves to become even better at what they do. The structure of Fated Duel is a fast-moving combat-themed card game involving unique decks representing multiple combatants and their fighting styles. Two players fight, train, fight again, train again, and then fight one final time to determine the winner. If an attack is pending, you defend against it to determine whether it succeeds. You draw your hand back up to your hand limit. You can make one maneuver, either playing a special Maneuver card, attempting to move to a different distance from your opponent, changing your stance, or discarding a card. You can make an attack against your opponent. 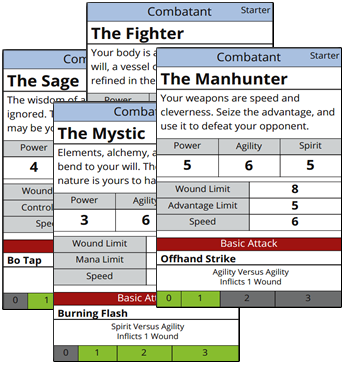 Combatant Card - indicates which combatant you're playing as, your various stats, and the basic attack you can always make. Stances - Every stance card you have goes into a special deck. Any one card in that deck can be on top, making it your active stance. Stances convey bonuses and, in some cases, penalties. Attacks - An Attack card generally provides a boost to your attack roll and various special effects. Attacks also have a range indicator on the card showing what ranges an attack is usable from. Maneuvers - These cards, playable during the Maneuver step, allow you to change the battlefield, build resources, enhance your attacks/defenses, and create other various effects. Defenses - These add specific bonuses to your defense attempts, and can have side effects triggered by using that card and/or succeeding in your defense. Trainings - Available only during training, these are static bonuses which are always in effect once gained. Hesitations - Negative deck filler cards that indicate hesitation on your combatant's part. These cards take up room in your hand but can't be voluntarily discarded, so they must be played in place of an attack, maneuver, or defense card. Failures - Representating serious unforced errors, these cards are played immediately when drawn and have dangerous effects. Combat is resolved by totalling attack and defense bonuses to determine whether the attacker or defender was successful. Each combatant has three core stats which determine their attack power and defensive effectiveness - Power, Agility and Spirit. Every attack is based on a stat and targets a specific stat. The bonus of an attack is the stat it's based on, any bonuses from an Attack card or any other cards in play, and the result of a roll of a six-sided die. The defense bonus, in turn, is the total of the stat the attack targets, any bonuses in play, and another die roll. If an attack or defense is successful, its card indicates its effects - most commonly, attacks inflict one or more wounds, and defenses prevent any wounds from occurring. Each combatant also has a Wound Limit - if the number of wounds you take reaches this number, you lose that battle. Both combatants then flip their wound cards over to Wisdom cards, and they begin the training phase. During the training phase, each player can strengthen their deck by buying new cards and/or removing old techniques and "filler" cards from their deck. Hard to say - the May schedule hasn't been cooperative, so there's been essentially no meaningful playtesting yet. I'd say what I have is an early prototype at best that would need some refinement and tuning, and could well turn out to have serious problems. Time permitting, I'll be coming back to both this game and Manaspire later on to see how well the tuning and revision process goes, and then this game especially would be a good candidate for print-and-play since the requirements are one small mat, several decks of cards, and two six-sided dice, which it's safe to assume most potential players have access to already. Nearly everything you need to play Fated Duel is included in the archive below - rules, battlefield mat, combatant decks, and wound/wisdom and resource decks. The only requirement beyond that is a six-sided die for each player. Everything here could use some refinement - there's no art, the Wound/Wisdom and Resource cards are extremely basic, and everything is laid out for easy preparation by hand but not for a proper printing (all cards have full printed borders, nothing is full-bleed, etc.). That said, it should all be in an entirely playable condition.